Electricians – or inside wiremen – and communications technicians can work on a variety of construction projects, including new construction, remodeling, maintenance and repair. In any situation, the work of an electrician can be both physically and mentally demanding and require them to work on many unique types of jobs presenting various new and different challenges. Much of the work of an electrician involves installation, assembling, testing, repairing, layout, and design of electrical wiring, fixtures, and apparatus used for power, light, heating, air conditioning, and many types of control systems. Many jobs now incorporate computer and fiber optics. 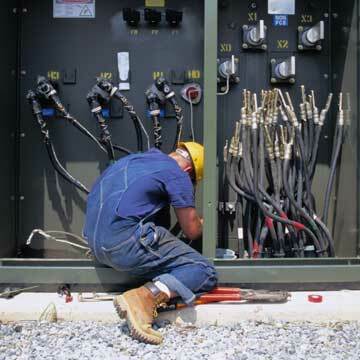 Electricians work is performed both indoors and outdoors in all temperatures, weather, and environmental conditions, and can require considerable physical effort for lifting, carrying materials and tools, and climbing ladders and scaffolds.